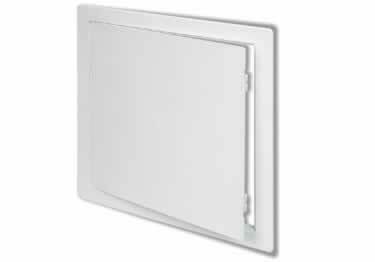 Get easy access to walls and ceilings with economical Acudor Plastic Access Doors. Constructed from high impact styrene plastic with U.V. stabilizers, these access doors won''t fade or corrode. Comes in a textured exposed white finish that can be installed as is, or painted to match surrounding surface. Removable door fits tightly into frame with snap latches. Easy installation, just apply caulking adhesive to the back of the frame and press into place. Available in eight sizes. Eight available sizes ranging from 4"x6" to 22"x22"
Available size: 4"x6", 6"x9", 8"x8", 12"x12", 14"x14", 14"x29", 18"x18", 22"x22"
We had to cut a hiole in 3/4" dry-wall and need to fill it with an access-door, pref'ly white plastic, with hinged access hatch opening into room. If we square-off the rough edgesm, we will have an 8.5" x 8.5" opening. Pls advise WHAT IS MIN. SIZE OF ACCESS HATCH THAT IS NEEDED .... I am not sure what your dimensions mean.... do they refer to the opening size or are they measured across the outside of the flanged face-plate? And how does the frame attach to the drywall so as to be ionvisible from inside the room? Get easy access to walls and ceilings with economical Acudor Plastic Access Doors. Constructed from high impact styrene plastic with U.V. stabilizers, these access doors won''t fade or corrode. Heavy-duty two-sided aluminum foil Radiant Barrier. Attic & crawl space walls & rafters. Lowers energy usage. Perforated rolls.